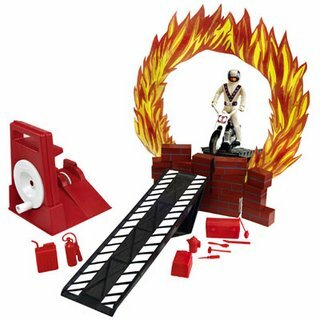 The Evel Knievel Super Stunt Set is back in production! Once again, you can own this treasured and much-abused* childhood toy, for a mere fifty dollars. ‘Cause it’s not for kids, right? They have no idea who Evel Knievel is. “He was like Triple X, only for real!” we can tell them, and they’ll just roll their eyes and go back to playing their Playstation 360s or whatever. Kids are losers. * I stuck pins in his rubber body. ← Jonathan Coulton to play PAX ’07?